Parks and Trails NY general mission is to expand and protect and protect parks and trail throughout the state. Representatives from the group told those gathered that after months of research, they have a plan that to provide “safe bike connections from the Mario M. Cuomo Memorial Bridge all the way to Pearl River.” The Orangetown Bike Study, as the drafted plan is called, provides recommendations for the improvement of already existing bike paths as well as propositions for new cycling facilities all throughout Orangetown. Financed by a generous grant from the Tappan Zee Bridge Community Fund, the proposed pathway will link local roads, neighborhoods and already established rail trails into one combined network, creating a universal bike path that will be “safe and accessible for all ages.” The Orangetown Bike Study calls for the creation of bike lanes on certain streets, increased signage to promote awareness of bikers, and improvements to the shoulders of roads that will become part of the newly established trails. The study also recommends enhancements to already established bike trails including an extension of the J.B. Clark Rail Trail, and improvements to the Old Erie Path. The project, which began in earnest last September, has been a community effort, with recommendations from local cyclists informing many of the choices made by Parks and Trails NY; roads included in the new path were selected based on advice from citizens and other factors including, speed limit and average daily traffic. 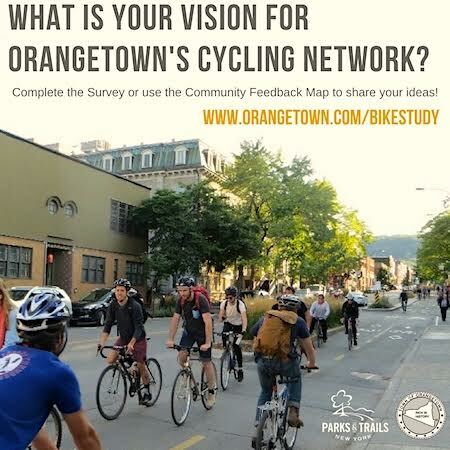 An interactive map of the proposed trails has been posted at Orangetown.com/bikestudy where citizens are also able to post comments and view the slide show that was presented at last week’s meeting.